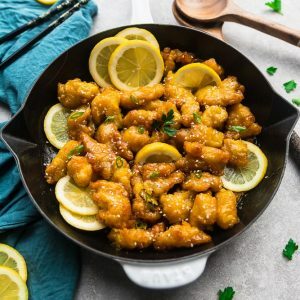 Asian Lemon Chicken - a homemade and lightened up version of the popular Chinese Takeout-Style Lemon Chicken coated in a sweet and zingy lemon sauce. Combine the sauce ingredients together in a medium saucepan. Measure out 3 tablespoons and add to a large mixing bowl. Set aside the saucepan. To the mixing bowl, lightly beat in the egg white and add chicken pieces. Mix well. In a large zip-top freezer bag, combine the cornstarch, panko crumbs, salt, and black pepper. Add the chicken and shake well to coat. Cook chicken using your preferred method below. While the chicken is cooking, heat saucepan with sauce on medium high. Allow to bubble and thicken while whisking and turn off the heat. Taste and adjust seasonings to what you prefer - add additional lemon for tangier, honey for sweeter and sriracha for spicier, if desired. Heat 2-3 tablespoons oil (or enough to lightly coat the bottom of the pan) in a large skillet over medium-high heat. Working in batches, add chicken and pan fry until golden and cooked through, about 3-5 minutes per side. Transfer to a large platter lined with paper towels. Repeat. Toss chicken together with the heated lemon sauce, coating well. Garnish with green onions, sesame seeds and serve immediately with rice or noodles, if desired. Preheat oven to 375F. Place chicken in a single layer on a large baking sheet lined with parchment paper. Bake for 12-14 minutes or until chicken is cooked, flipping once in between. Turn oven to broil for 2-3 minutes or until chicken pieces turn light brown on top and crisp up. Watch your chicken closely so it doesn't burn. Remove chicken from oven and toss together with heated lemon sauce, coating well. Place chicken in a single layer in the cooking tray (you will have to cook in batches depending on how big your air fryer is. Air fry 8 minutes, turning halfway. Until golden. Remove chicken from the tray and toss together with the heated lemon sauce, coating well.